Dark reaction involves conversion of carbon dioxide into carbohydrate. It occurs in the stroma of the chloroplast and involves many reactions, each catalyzed by a different enzyme. The dark reactions require the products of light step (ATP and NADPH2), but does not itself requires light. This is why it is referred to as dark reaction. The fixation of carbon dioxide in the dark step of photosynthesis is referred to as the C-3 pathway because the first product, 3-PGA, is a 3-C compound. The that exhibit C-3 pathway are called C-3 plants. Melvin Calvin and his colleagues worked between 1946 and 1953 with unicellular alga Chlorella to investigate the steps in CO2 fixation. They allowed the alga to photosynthesis and attain a constant rate of photosynthesis. Then they introduced radioactive 14CO2 into the solution in which the alga was growing for a brief period. The intention was to label the intermediate compounds produced during the cycle. The cells were then killed and their enzymes inactivated by dropping them into the boiling alcohol (80% ethanol). It was found that after photosynthesizing for 60 seconds in radioactive 14CO2 the alga has formed many compounds containing most 14C was a phosphorylated 3-C sugar, 3-phosphogiyceric acid (3-PGA). Later, it was found that many more phosphorylated sugars are produced by reduction of 3-phospholyceric acid. Later in 1954, an enzyme ribulose bisphosphate carboxylase abbreviated as rubisco was discovered and found to catalyze the CO2 with RuBP to form an unstable 6-C compound that splits into two molecules of 3-PGA. Rubisco is functional in all photosynthetic organisms except in a few photosynthetic bacteria. Also, it is most abundant protein enzyme on earth. 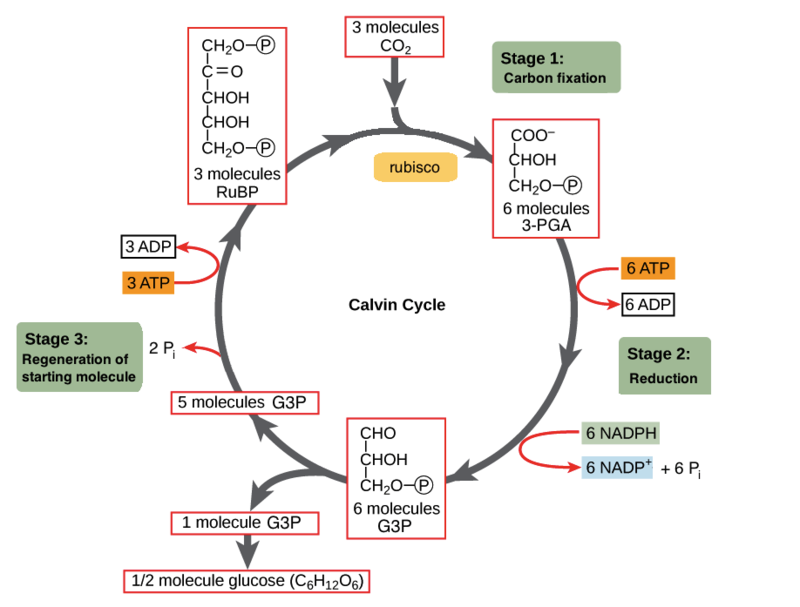 The Calvin cycle comprises of four steps: carboxylation of CO2 acceptor (RuBP); reduction of 3-PGA to 3-phosphoglyceraldehyde (3-PGald), the first carbohydrate; regeneration of CO2 acceptor; and product synthesis, i.e., metabolism of carbohydrates, amino acids and lipids from 3-PGald. The CO2 enters the Calvin cycle by reacting with ribulose-I, 5-bisphosphate to form two molecules of 3-phosphoglycerate. The reaction is catalyzed by enzyme ribulose bisphosphate carboxylase (rubisco), found in the chloroplast. The CO2 is incorporated into the carboxyl group of the 3-phosphoglycerate. The affinity of rubisco is quite high for that CO2 ensures carboxylation at low CO2 concentration. 3-phosphoglycerate is essentially an organic acid and is not at the energetic level of a sugar. The COOH group of 3-PGA is first phosphorylated to 1 ,3-bisphosphoglyerate (1, 3-bis PGA) by ATP produced during light reaction and then reduced to 3-phosphoglyceraldehyde (glyceraldehyde 3-phosphate), a triose P-sugar, using the NADPH2 formed in the light reaction. This step is catalyzed by enzymes, phosphoglcerate kinase and NADP 3-phosphoglceraldehyde dehydrogenase, present in chloroplast. Continued fixation of CO2 requires constant regeneration of CO2 acceptor. The RuBP is regenerated by a complex series of reactions involving 3-, 4-, 5-, 6- and 7- carbon sugar phosphates. Three molecules of RuBP are formed by reshuffling the carbons from 5 molecules to 3-phosphoglyceraldehyde. One molecule of 3-PGlad is converted to 3-phosphodihydroxyacetone (dihydroxyacetone 3-phosphate). 3-phosphodihydroxyacetone undergoes aldol condensation with a molecule of 3-phosphoglyceraldehyde to give fructose-1,6-bisphosphate. This product is hydrolyzed to fructose-6 phosphate. C-1 and C-2 of fructose-phosphate is transferred via cofactor to a third molecule of 3-phosphoglyceraldehyde to give erythrose 4-phosphate and xylulose 5-phosphate (from C-3 to C-6 of fructose). Erythrose 4-phosphate then combines with 3-phosphodihydroxyacetone (fourth molecule of, triose phosphate) to yield a 7-C sugar sedoheptulose 7-phophate. Sedoheptulose donates two carbons to the fifth molecule of 3-phosphoglyeraldehyde and produces ribose 5-phosphate (from C-3 to C-7 of sedoheptulose) and xylulose as products. Two molecules of xylulose 5-phosphate are epimerized to give ribulose 5-phosphate. A third molecule of ribulose 5-phosphate is formed by isomerization of ribose 5-phosphate. Finally, the ribulose 5-phosphate is phosphorylated with ATP to regenerate the CO2 acceptor ribulose-1,5-bisphosphate. The net outcome of Calvin cycle is the generation of one molecule of triose phosphate from three molecules of CO2 during every three turns of the cycle. The excess triose-P (3-PGald) is used for starch synthesis within the chloroplast or sucrose synthesis in the cytosol. In addition, fats, fatty acids, amino acids and organic acids have also been shown to be synthesized in carbon dioxide fixation. These products are synthesized under different conditions of light intensity, CO2 and O2 concentration. A large proportion of triose phosphate is converted to hexose sugars, especially glucose and fructose. If carbohydrates are to be transported from the leaf cell where it is made to another part of the plant, then the disaccharide sucrose is made by linking together a glucose and a fructose molecule. The sucrose is then exported from the cell and loaded into the phloem sieve elements for translocation to other areas of the plant. For storage purposes, many glucose molecules are linked together to form starch molecules. These are stored as starch grains inside the chloroplasts. If the plant is growing then large amount of cellulose are made, by linking together many glucose molecules, to from new cell walls. Triose phosphate can be converted into acetyl coenzyme A, which is then converted into fatty acids. These are combined with glycerol from glycerol phosphate formed from triose phosphate, to make triglycerides (mostly for storage) and phospholipids (for cell membranes). To make amino acids and hence proteins, plants need a nitrogen source. They are unable to use nitrogen from air because it is too much unreactive. Most plants obtain their nitrogen as nitrate ions (NO-) from soil. Inside the plant cells the nitrate is reduced to ammonium ions (NH4). The nitrogen from the ammonium ions is then transferred to alpha-keto-glutarate which is made from triose phosphate during Krebs cycle. This produces the amino acid glutamine. Other amino acids then can be made by transferring the amino group, NH2, from one compound to another in a process called transamination. Once nitrogen has been incorporated into molecules in this way, the plant can use these molecules to make other nitrogen containing compounds. These include nucleotides (DNA and RNA) and also chlorophyll.